In our garden this year we had two hills, with five seeds per hill, that produced over 60 pounds of winter squash. Considering the seeds cost 14¢ each that is a tremendous return. However there are other expenses besides the price of seed that should be looked at. 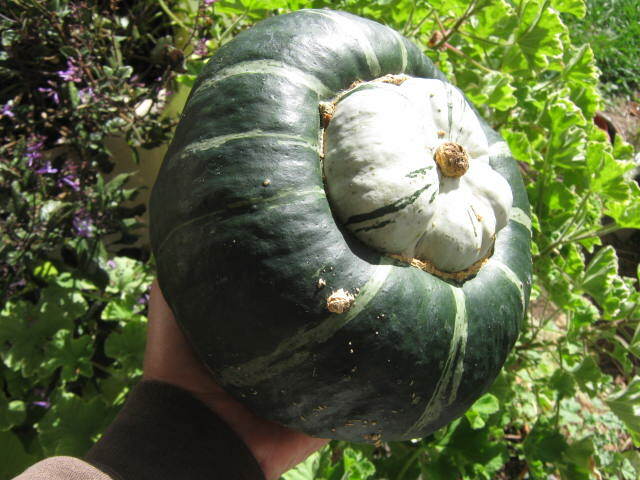 We grew a lot of food from just a few buttercup squash seeds. The largest expense would be the labor involved in preparing the soil, planting the seeds, caring for the plants, harvesting and storing the crop. Some people would also factor in the opportunity cost of their labor. In other words, “what could I be doing with that time that may make me more money?” If gardening is looked at as part of person’s recreational or exercise time, then there are no labor costs. It certainly has more income potential than watching TV. Now, on the other hand, if we hired someone to do the tilling and irrigation the costs would jump up dramatically. If you were to make these calculations on your own plot of land, those costs would have to be taken into consideration. Business people would look at other things such as value of the square footage of the land, property taxes for that area, equipment amortization, and other items. Even if all of the other expenses are factored in, the return on investment is still very high especially compared to other activities. A CEO of a large, well-known horticultural business figures the return in a garden can be up to 25,000% annually. Of course we’re looking at production on a small plot of land tended by a person during their off-hours. So why aren’t all farmers multi-millionaires if the return on investment is so great? Once you start scaling up production the economics changes. At that scale much more needs to be invested in machinery, energy, labor, taxes, interest on borrowed money and all of those other things that go into operating a farm. For us gardeners though, we can have the satisfaction of knowing we are such shrewd investors. I think I’m pretty good at getting my USDA daily fruit and vegetable recommendations, especially during the growing season. I must admit though, I’m not so good about it during the winter. 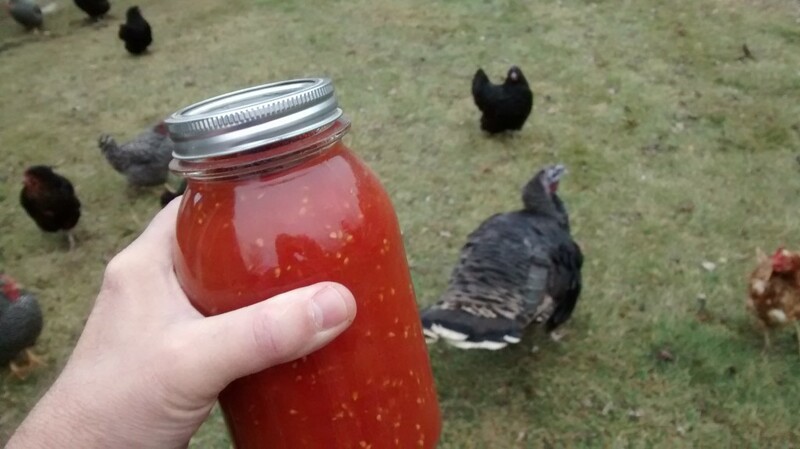 I have a good amount of my harvest from the garden frozen, canned and dehydrated so it should be easy enough for me to do. My problem is that I think I won’t have enough to get me through the winter so I try to parcel it out evenly week by week. By summer I usually end up with things left over when I could have been using them to get my daily requirements. After all, there’s always the grocery store if I get low. We have canned tomatoes, frozen tomatoes and dehydrated tomatoes from this years harvest. Most people eat just a fraction of fruits and vegetables of what is recommended. If it weren’t for french fries and ketchup, some people won’t eat any vegetables at all. I know of some people who wear that as a badge of honor. But what would happen if everyone decided to start eating their fruits and vegetables like they’re supposed to? A recent USDA survey found that there would not be enough fruit and vegetables to go around. Our population as a whole would increase its consumption of fruit and vegetables buy 132 percent while farmers would need to increase acreage by 137 percent — from 6.5 million acres to 15.3 million acres. That leaves a lot of potential demand for those who want to get into farming. A person could start out on a small scale selling their produce at local farmer’s markets and roadside stands. Gardening could also make up part of this demand. A separate study done in Flint in 2009 showed that people in urban areas who participate in in a community garden are 3.5 times more likely to eat fruit and vegetables five times a day. That makes perfect sense to me, who wants to do all that work and not eat the fruit of their labors? That doesn’t even take into account the extra produce that was given away to family and friends. How did you do this year, are you still getting part of your daily requirements from your 2015 garden harvest? Let us know in the comment section below.